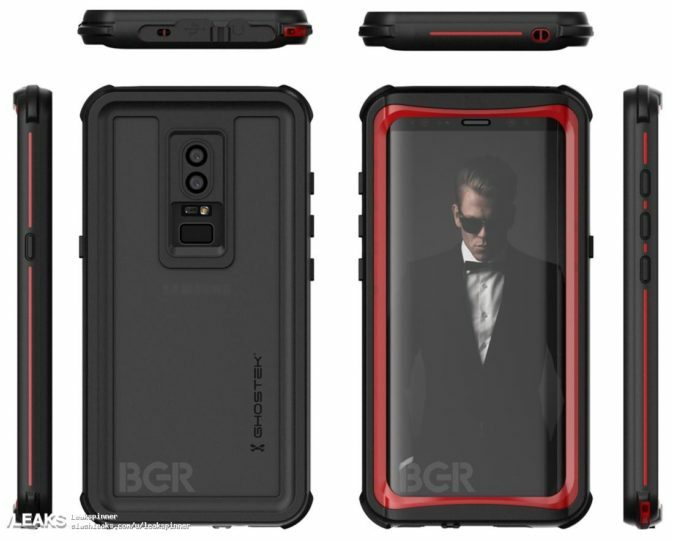 The Galaxy S9 is still a ways off from making an official appearance, but case renders leaked by BGR purportedly show the near-final design of Samsung’s 2018 flagship. Based on information “from the factory that is building Samsung’s new flagship phones”, these renders (from case maker Ghostek) are said to be “mostly accurate” and suggest that Samsung will be making a few minor but useful changes to the design that debuted with the Galaxy S8. Galaxy S9 renders: Fingerprint sensor finally where it should be? According to BGR’s sources, the back of the S9 is portrayed accurately in the renders, which means Samsung will finally position the fingerprint sensor in the proper place. In fact, the site says the dual cameras on the S9 will be positioned vertically, so the fingerprint sensor will be further down on the phone’s body and, therefore, quite easy to reach. At the front, the bezels above the display will reportedly be narrower on the final version of the S9, and the speaker at the top will look slightly different. The rest, as expected, will supposedly not change much. There are the usual power and volume buttons and the dreaded (or useful, depending on how you look at it) Bixby button. The headphone jack seems to be included as well, which shouldn’t be surprising considering Samsung only recently made fun of Apple for removing the headphone jack and forcing its consumers into living the dongle life. Popular leakster Evleaks suggested that Samsung won’t make a drastic change with the Galaxy S9’s design, and that certainly seems plausible when paired with what we can see in these renders. Naturally, these renders may be far from accurate, despite what the source of the renders might say at this time. Yes, we know that Samsung has been rather unsuccessful at keeping its devices a secret ahead of launch. But it’s still better to be skeptical, if only because that will make for less disappointment should Samsung, for example, decide to keep the fingerprint sensor in the awkward place it is on this year’s flagships. The Galaxy S9 is rumored to go into production in December, so we should see more information crop up in the coming weeks to clear things up. What do you think of the renders? Is that a design you can get behind, or do you think things are fine as they are right now? Cool, but again no stereo speakers 🙁 and they have a great company in their possession which is called Harman/Kardon! Is the wallpaper, milo yiannopoulos? ?